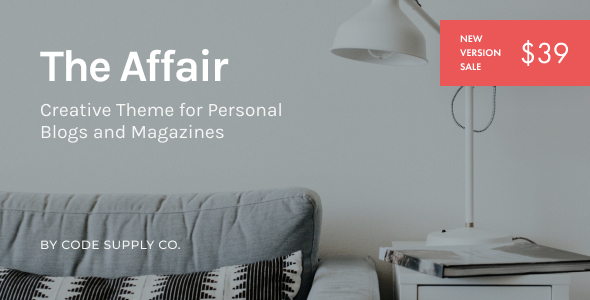 The Affair is a clean responsive WordPress Theme for creative blogs and magazines. Enjoy the minimalist look, well-thought typography and various options and features, including slideshows, galleries, featured text and images. Support We provide support through our ticket system. We do not generally provide support via e-mail or comments on ThemeForest. Therefore if you would like your issue to be reviewed as soon as possible, please open a ticket at codesupply.co/support. We try to response as fast as possible, generally within a few hours, however on holidays and weekends it may take up to 24 hours. The Affair has been tested with browsers Firefox, Safari, Chrome, Edge.